Buying a hybrid car has always been a great idea, but that was not an easy choice for many French between the Japanese cars and the expensive German models. There was a great relief when a French hybrid came to market, last February. 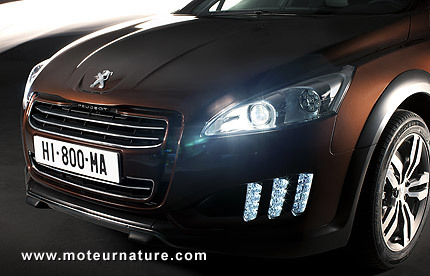 Actually, things happened quite fast because the first model, the Peugeot 3008 Hybrid4 was quickly followed by the Citroën DS5, with the Peugeot 508 RXH (left picture and video below) arriving this week at dealerships. 3 French hybrids are on the market, and French customers have been responding. For years, hybrid market share was very low in France. It was a niche market only getting about 0.5% of the market. That is still the case today. There were 2,807 gasoline hybrid cars sold in France in the first quarter, out of 507,089 new cars. The French hybrids are easy to spot on the registrations data: they are all diesel hybrids. 1,534 have been sold already. Considering their limited availability, we are confident hybrids (gas and diesel) will soon get more than a 1% market share. One question remains, though. Will the diesel hybrid beat the gasoline hybrid? Great information! Diesel will definitely beat gas! Even with diesels, hybrid sales are still very low.